II. Latinos in the U.S.
“Latino” and “Hispanic” — the two terms are used interchangeably throughout the report and refer to adults, age 18 and older. Over the last decade, the internet has become woven into American life, just at the time that Hispanics have become the fastest growing component of the U.S. population. By working in partnership, the Pew Hispanic Center and Pew Internet Project provide a snapshot of the intersection of these two trends – the Latino internet user population. 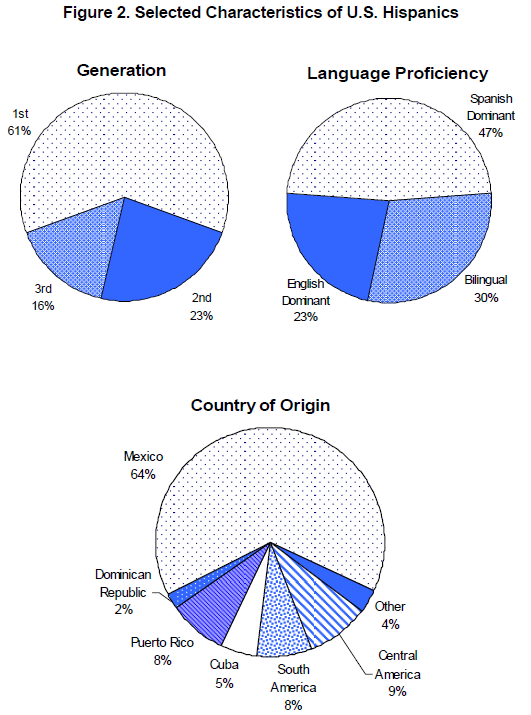 To begin, we offer a summary view of the Latino population in the United States. 59% of Latino adults have graduated from high school, compared with 88% of whites and 79% of African Americans who have a high school degree. Among those reporting income, Latinos as a group are markedly poorer than whites and somewhat poorer than African Americans. Sixty percent of Latino adults were born outside the U.S. Among these immigrants, about two-thirds have lived in the country for 11 years or more. The remaining third of foreign-born Latinos are evenly split between those who have been in the States for five years or less and those who have been here for 6 to 10 years. About one-third of Hispanic immigrants are citizens of the U.S. One-quarter of Latino adults are second-generation Americans, meaning they were born in the U.S. but at least one of their parents was born outside of the U.S. Sixteen percent of Latino adults are third-generation Americans, meaning they were born in the U.S. and both parents were born in the U.S. While Mexican-origin persons comprise the majority of Latinos in the U.S., there are ever-growing numbers of Latinos from other countries who bring their own traditions and characteristics.